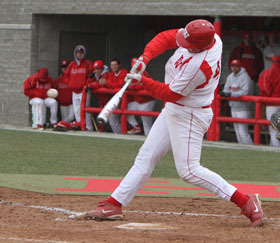 The Wabash baseball team will play Shenandoah University in the Millington, Tennessee Region of the 2011 NCAA Division III Baseball Regional. The Little Giants will play their first game of the tournament at 3:30 p.m. (CDT) Wednesday afternoon in Millington. Wabash will be the number-five seed in a six-team South Region, while Shenandoah (34-5 overall, 11-1 in the USA Southern Athletic Conference) is the number-two seed. The Little Giants will be making their first appearance in the NCAA baseball tournament in school history after winning the North Coast Athletic Conference baseball tournament to secure the league's automatic bid, while Shenandoah returns to the national tournament for the third consecutive season. The Hornets are fourth in the nation in the D3baseball.com/National Collegiate Baseball Writers Association rankings and third in the American Baseball Coaches Association poll. Shenandoah received one of 17 at-large bids from the NCAA DIII baseball tournament selection committee after the Hornets lost 5-4 to Christopher Newport in the championship game of the USA conference tournament. Christopher Newport (39-5, 10-2 USA) is ranked number-one in the ABCA poll and second by D3baseball.com/NCBWA, and will be the top seed in South Region. Christopher Newport will face Webster College (31-11), the six seed, in game one at noon on Wednesday. Piedmont (30-13; third seed) and Salisbury (29-11; fourth seed) will join Wabash, Shenandoah, Christopher Newport, and Webster at the South Regional. Rhodes College will serve as the host school for the tournament. Shenandoah is led by Greg Van Sickler, the USA Pitcher and Player of the Year. The senior hit .400 for the season, collecting 62 hits in 155 at bats. He hit 16 doubles, three triples, and seven home runs and had 38 RBI for the year. On the mound, the right-hander is 10-1 with a 2.02 earned run average heading into the NCAA tournament. He has 73 strikeouts and only nine walks in 80-1/3 innings on the mound, helping him Pitcher of the Year honors for the second straight season in the conference. Kevin Brashears tops the Hornets' statistics with a .404 batting average. He has 63 hits, including five home runs and a team-best 40 RBI. Clint DeHaven has smashed 11 home runs this year while batting .272 for Shenandoah. Head Coach Kevin Anderson was named the USA Coach of the Year for the first time since he joined the Hornets in 2003. He has guided Shenandoah to NCAA DIII Regional baseball titles in 2009 and 2010. Christopher Newport and Webster will open South Region play at USA Stadium in Millington, Tennessee at noon on Wednesday. Wabash and Shenandoah follow with a 3:30 p.m. first pitch in game two. Piedmont and Salisbury will play at 7 p.m. Wednesday evening. The two losing teams from games one and two will play an elimination game at noon on Thursday. The winner from game one and the loser of game three will play at 3:30 p.m., followed by the winners of games two and three from Wednesday. The tournament continues until a regional champion is crowned on Saturday.